Hillsong Church Board and Elders risk credibility over latest Hillsong statement? Home › Hillsong › Hillsong Church Board and Elders risk credibility over latest Hillsong statement? Contrary to the Royal Commission’s finding, The Hillsong “Church” Board and Elders recently released a controversial media statement in defense of Hillsong and Brian Houston’s management over the allegations of his father’s pedophilia revelations. 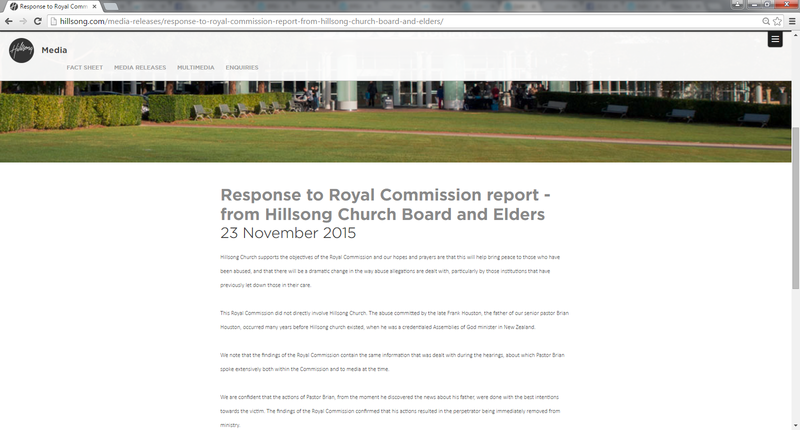 Source: Hillsong, Response to Royal Commission report – from Hillsong Church Board and Elders, http://hillsong.com/media-releases/response-to-royal-commission-report-from-hillsong-church-board-and-elders/, 23/11/2015. Accessed 23/11/2015. 1. Frank Houston admitted that he had abused a number of young people. 2. He was dismissed from the AoG ministry permanently as a direct result of that confession. 3. Brian covered it all up, and failed to warn warn thousands of congregants in Australia. 4. The Royal Commission has now found against his actions at the time – e.g. : conflict of interest. I find they just gnore you & take the offerings.